Ray Tschoepe joined the staff of the Fairmount Park Historic Preservation Trust, now merged with the Fairmount Park Conservancy, in the summer of 2000. 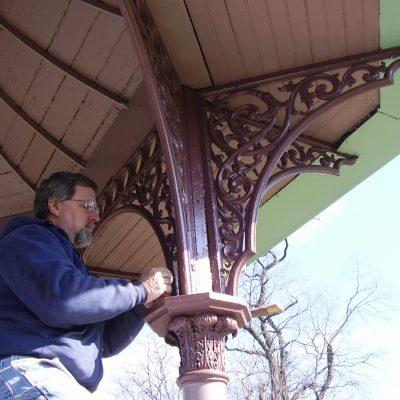 As the Director of Conservation, he works with a talented staff to conserve 18th and 19th century buildings and dozens of sculptures scattered throughout Fairmount Park. Some projects of note include the restoration of Cedar Grove, Ryerss Mansion, the Letita Street House, the Centennial Comfort Stations, the Glen Fern complex of buildings, Morris’ the Highlands, Wm. Hamilton’s the Woodlands, the greenhouse at Eastern State Penitentiary, the Fairmount Park Guardhouses, Solitude on the grounds of the Philadelphia Zoo and Glen Foerd on the Delaware. The Fairmount Park Conservancy has also partnered with the Preservation Alliance for Greater Philadelphia to conduct workshops for homeowners. These cover various topics from mortar and masonry to window restoration. In 2014, Tschoepe conducted a workshop at the Keystone Connection Forum conference sponsored by the NAPC and the PHMC. Ray grew up in Philadelphia and attended the University of Pennsylvania as an undergraduate. After graduation, he spent a number of years in healthcare, including a faculty appointment at the University of Pennsylvania’s School of Medicine, as both a researcher and scientific illustrator. Ray returned to Penn and graduated from the School of Fine Arts master’s program in Historic Preservation. He then worked for nearly 10 years as an independent restoration contractor. Among many preservation projects, Ray worked toward the restoration of elements of Bellaire manor, Letitia Street House, Malta Boat Club and the entry doors and panels of Founder’s Hall at Girard College. In 2000, Ray was invited to join the adjunct faculty of the historic preservation program of Bucks County Community College. He teaches a core course in Building Conservation. In 2008, he received an award for excellence given to adjunct faculty. In 2006, Ray was invited to join the staff of Old House Journal as a contributing editor. Since then he has written, illustrated and photographed numerous articles. Ray continues to lecture at conferences and workshops for Traditional Building and the Association for Preserving Technology throughout the east coast.